In a South African context, the word “hostel” refers to a housing compound that was developed and designed for black migrant workers in the early days of South Africa’s history. Mines needed labour to dig the diamonds and gold which fueled the early country’s economy - around these mines the cities of Kimberley and Johannesburg developed. But the early white settlers had a problem - they did not want the migrant workers to mix with their race, nor did they want black people to establish a permanent foothold inside cities. Instead, mine owners devised a system of temporary migrant labour, whereby black workers would live inside highly controlled living quarters without their families, and visit home once per year. These buildings were designed for maximum control, with architectural features enabling total surveillance and restriction of movement. Dozens of hostels still exist in South Africa, housing tens of thousands of people. They exist not only in cities, but also on the still-functioning gold and platinum mines near Johannesburg. Most of them have been “upgraded” and are not restricted to male tenants, but the original shape and interiors remain. Owing to their distinctive shapes and fortress-like exteriors, many hostels are considered dangerous and impenetrable, synonymous with xenophobic violence, crime, and the perils of the modern urban experience. This is an ongoing research project looking at these monoliths from the air - their structure, their symmetry, their aesthetics of control, and their reasons to exist. 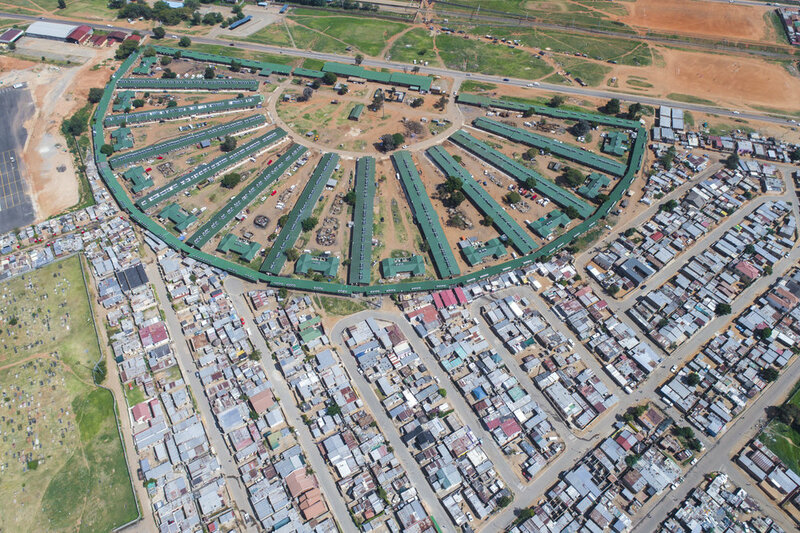 This history of hostels and workers’ compounds in South Africa cannot be told without considering the historical narrative which preceded their construction. In particular, it is important to focus on the rural-urban migrations which to this day provide a key form of livelihood procurement for large numbers of people. The migrant labour system in South Africa is vital to understanding the links between the rural and urban, and the oscillation of men from their home to some place of work. The system ensured that black people were “temporary sojourners” in white urban areas, and that the cost of labour would be met in the “reserves”. The rapid growth of the gold mining industry meant that by 1899, gold mines employed about 100,000 black people. The industry had a high demand for cheap, unskilled labour and provided a model for the country’s labour policy which in turn shaped urban development and spatial planning within cities. Controlling where and how people lived, as well as their movements, seems to have been one of the most essential parts of the migrant labour system. This system gave birth to the hostels and to the compounds, structures built primarily for the containment of labour and not for human comfort. The idea of urban hostels as a mechanism for total control was not a new one; the architecture borrowed heavily from “compounds” first established on the diamond mines near Kimberley. These “compounds” were built by the mining companies and intended for African laborers; they were designed to enforce total control, providing a minimum standard of shelter, and an architecture of restricted access and containment. Although upgrades and modifications have been made in a variety of ways since the construction of locations such as Langa, tens of thousands (if not more) still live in buildings specifically designed to enforce total control, subjugation to authority, and overwatch. The Lwandle hostel near Cape Town is easy to miss these days from the ground, a series of low-slung buildings unremarkable in every way from the surrounding concrete houses and shacks. But an aerial view reveals a striking design. The hostel complex resembles a bulls-eye, leading directly to the center of one of Cape Town’s most historic and oppressive settlements. Designed in the 1950’s as a worker’s compound for the fruit and canning industries, Lwandle hostel used to stand alone. 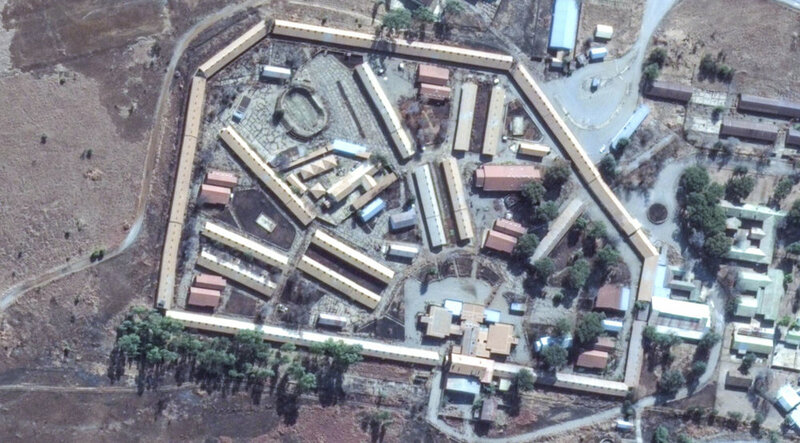 Photos show the distinct chevron-type pattern of the hostel buildings surrounded by a “buffer zone”, 250m wide, designed to prevent racial mixing and ensure control. Dormitory-style buildings were constructed around a central core space, allowing for “clear lines of sight” along the rows. Each unit had a single exit/entrance, was divided into two rooms, each of these further subdivided into four small, conﬁned individual compartments containing two or four beds, with up to 32 men in a hostel block. 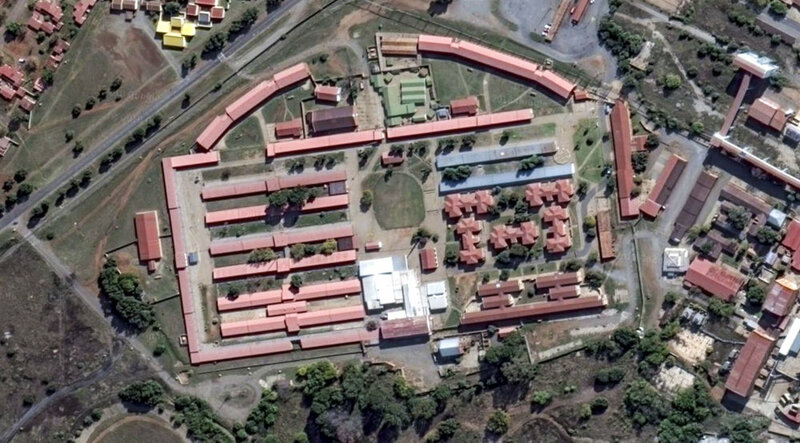 Lwandle and all other hostel blocks were laid out according to the “Kimberley model”, referring to the compounds developed by De Beers around their diamond mine, which became the ‘blue-print’ for migrant labour compounds in South Africa. This was a design of control, denial of access, and surveillance. As the state sought to enact increasing levels of control over migrant workers, including where they lived, how they moved, and what their family life consisted of, more and more hostels like Lwandle were constructed. By the late 1980s, the population estimated to live in a hostel environment was between 400,000 and 1 million (depending on whether you count the work force directly employed by the mines), a sizeable percentage of the total population. Part of this project is about witnessing these hostels for what they are – inscriptions upon the surface of the earth, done with attention, care, and a high degree of planning. This is a historical record of the men (and they were all men) who sat at a drafting board, conceived a plan, and executed their designs with a high degree of skill. Put together, South Africa is covered in this legacy architecture, a uniquely oppressive but not uncommon manifestation of oppression. Research for this part of the project came from: Vedalankar 1993, “Development Initiatives in Hostels in South Africa”; Attwell 2014, “Zwehile Hostel Site Socio-Historical Study”; and Murray and Witz 2013, “Camp Lwandle: Rehabilitating a migrant labour hostel at the seaside”. 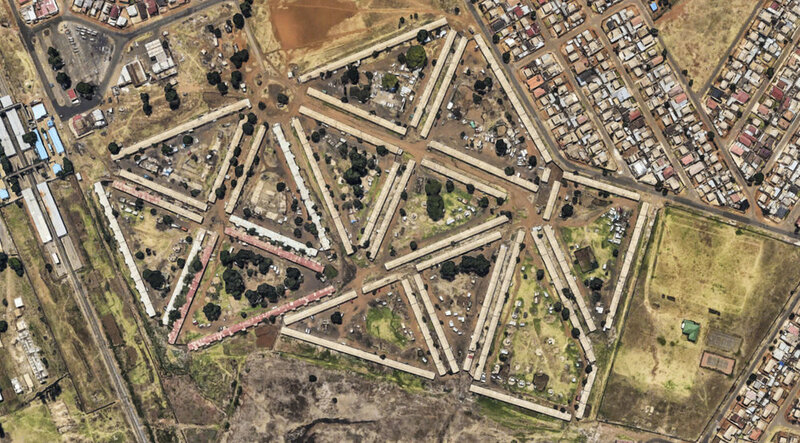 Compound B is a well-preserved example of a hostel near Johannesburg, which is surrounded by fresh development intended to meet the needs of South Africa’s vast housing crisis. It was constructed during the run up to wartime, 1940, and attached to the Rand Leases Mine which produced gold. The mine was prosperous, but like most mines in the region, eventually expired, underwent several changes in ownership and finally shut in 2004. It’s been almost completely gutted and stripped of roofing and valuable fittings, although not ceased to be a home for several itinerant residents. The exterior of the building resembles a prison; it almost befits an architecture of such violence, that the people would have reclaimed anything they could as a form of restitution. Each room had several concrete bunks, many without mattresses, stacked three high where 20 workers would sleep. There was a kitchen block, an outside courtyard, but no formal recreation block that was covered. Therefore, almost all living and socializing took place in the cramped interiors of the rooms. There were two entrances, both carefully controlled, and entrances from each room opened only to the inner courtyard. Shockingly, the cramped conditions were less than half the size of what was prescribed by law in the Slums Act of 1951 - however “Native Hostels” were subject to much less stringent regulations. As most of the workers would have been foreign laborers, probably from Angola, Mozambique, or other countries, their interaction with the wider economy and population of South Africa was carefully controlled. Breaks - only males were allowed inside. “Because black labour was regarded as nothing more than a necessary commodity to ensure that the mines remained operational and comfortably viable, there is little in the architecture of the complex that speaks to human welfare and comfort.” The hostel is currently being prepared for a new role as an architectural anchor in the area, and its imposing Modernist brickwork dominates the landscape. Proposals have been made to set aside at least one of the worker’s rooms as a museum to migrant laborers. Research for this part of the project came from “CS Design CC t/a ARCON Specialist Architectural & Heritage Consultants, July 2014. Heritage Impact Assessment: Old Rand Leases Mining Compound B, Fleurhof t 10, Roodepoort.”, thanks to the help of Chris Snelling and Graham Jacobs.